Since loaf, from hlaif-, appears to be a more ancient word for “bread” (as noted in the posts for October 17 and October 24), people must have coined bread, to designate the product that was different from the old one. Below, I’ll risk promoting an old etymology of loaf, even though at present it does not seem to have any supporters. In the posts, referred to above, I mentioned a Slavic word sounding very much like loaf (Russian khleb “bread” and so forth). The opinion that khleb was borrowed from Germanic seems to be well-founded, but there is a detail never mentioned in the more recent works. Next to khleb, Russian has the verb khlebat’ “to slurp, guzzle” (stress on the second syllable). The most authoritative etymological dictionary of Russian by Max Vasmer does not connect them and calls khlebat’ a sound-imitative word, which it probably is. The same, much more certainly, holds for Dutch slurpen ~ slorpen, the source of Engl. slurp. But some older scholars believed that khleb and khlebat’ are related, and they might be right. An excellent recent book on the development of Russian etymology since Vasmer’s days skips khleb or khlebat’, and I conclude that no post-Vasmer works deal with those words. It does not seem to have occurred to anyone that khleb itself might be a word of at least partly onomatopoeic origin. Russian khliobovo (io = Russian ë; stress on o) denotes “liquid food” and is obviously derived from khlebat’ (a more “Standard” name for this kind of food is po-khliob-ka). It sometimes happens that borrowed words retain the senses lost in the original language. 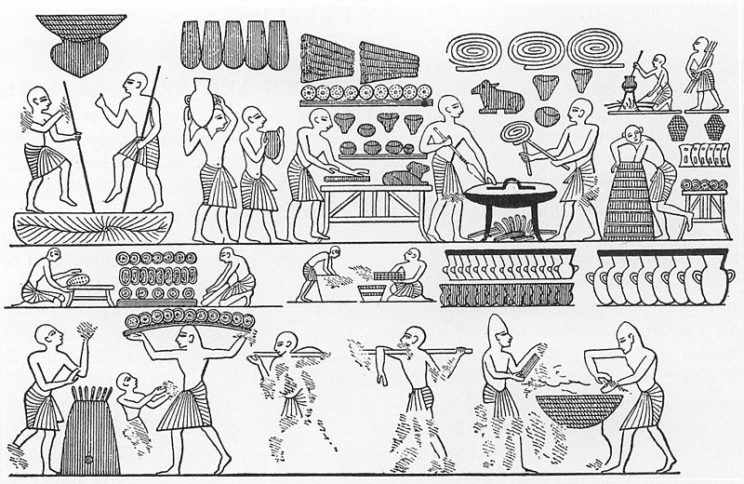 When modern etymologists compare the early history of loaf and bread, they tend to base their hypotheses on the opposition “unleavened food” versus “the food raised with yeast.” Those who connect bread and brew say “the food brewed with yeast.” From the historical point of view, the development was certainly from unleavened to leavened bread, but this is a general proposition. As we will see, in our case, one fact even militates against this reconstruction. A meatloaf. What a misnomer (unless LOAF means “food”!). Image credit: MeatloafWithSauce by Renee Comet. Public Domain via Wikimedia Commons. Another circumstance of some significance is the extremely general meaning of bread: daily bread, not by bread alone, and the like. Bread has taken over the original senses of hlaif-, and it looks, as though at one time, hlaif- meant “food in general.” Is it not possible that in the remote past hlaif– referred to some “generic” food that could be more or less “slurped,” while bread designated something more solid? To put it differently, could hlaif– be a kind of thick broth, with brauð– meaning what we today associate with bread? There is another approach to loaf. Gothic preserved the verb hleib-jan “to take care of someone; help; strengthen.” The Gothic Bible was translated in the fourth century from Greek, and the Gothic form hleib-ida rendered Greek anti-lámbetō, the middle voice of anti-lambánō. The Greek verb had many senses. The relevant line occurs in Luke 1: 54 and sounds in the Authorized Version so: “He hath holpen his servant Israel.” The same Greek verb occurs in 1 Timothy 6: 2, where the Authorized Version has partakers. Since hleibjan turned up only once in the extant text of the Gothic Bible, we cannot know its full range of meanings, but its cognates elsewhere in Germanic mean “to protect.” The root hleib– is such a perfect match for hlaif– (by ablaut) that their possible, even probable, connection has often been suggested. And here I should return to the circumstance complicating the yeast theory. Old English had the verb hlīfian “to rise high, tower.” It has been connected with hlaif-, the implication being that the product containing yeast rises. But it is not “loaf” but bread that is supposed to have been made with yeast! Pancakes or bread in the making. 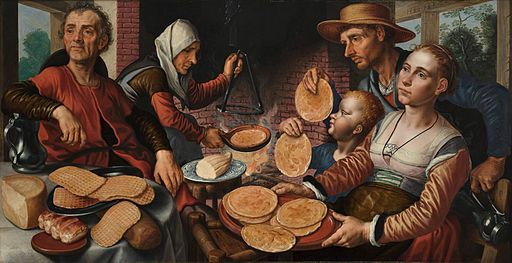 Image credit: The Pancake Bakery by Pieter Aertsen. Public Domain via Wikimedia Commons. If my idea that the most ancient bread (called hlaif-) was not solid and resembled thick broth (or perhaps some sort of polenta?) has any merit, then that product had nothing to do with yeast or its absence. In the earlier posts, I mentioned the Latin word lībum “cake, pancake” and German Lebkuchen “gingerbread.” I’ll let Lebkuchen in limbo, for there are some difficulties with its history, but, if lībum is connected with Greek leibō and Latin lībo “I pour,” then again we encounter a liquid in the production of the most ancient bread. After all, pancakes are prepared from batter, which one pours onto a hot saucepan, and, as far as we know, pancakes were the earliest and the most widespread cereal product eaten in the prehistoric past. Not all the words mentioned above belong together, but, from whichever angle we approach the origin of loaf, we seem to encounter liquids. 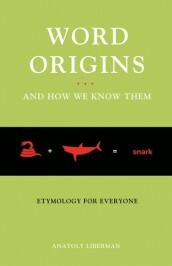 This connection might have given rise to the association between hlaif– and onomatopoeic words like slurp. Later, solid bread was invented. By way of conclusion, I’ll return to monomaniacs. The distinguished modern etymologist Jost Trier is the author of many excellent works and certainly does not belong with Charles Mackay and others like him, but he attempted to derive multiple words from the idea of the ancient fence that separated one community from another. I think he went too far. Thus, he suggested that the root of hlaif– meant “to bend, lean” and explained it as designating “moistened clay used in wattling.” Two excellent dictionaries cite Trier’s explanation: one without comment, the other approvingly. In my opinion, this is another basket case. Producing a loaf? Image credit: Ramses III bakery. Public Domain via Wikimedia Commons. Fortified with so much liquid food, we are now ready to attack a loaf of modern bread. Next week I’ll bring this series of essays to a close. Featured image credit: Wheat field by Polina Rytova. Public Domain via Unsplash. 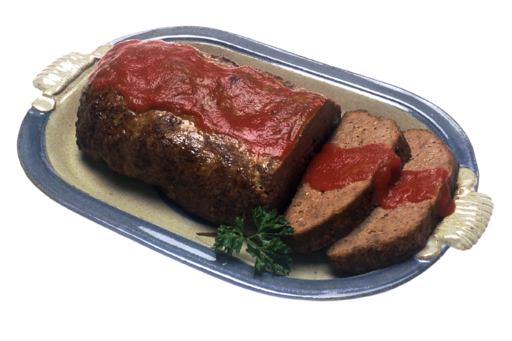 I would maintain that the word “meatloaf” is not a misnomer at all. It is typically prepared in a loaf pan (the same kitchen implement used to make loaves of bread) and therefore comes out looking like a loaf of bread and is sliced like a loaf of bread (as shown in your photo). Occam’s razor, once again. Bringing in khleb along side khlebat’ obscures that their vowels actually differ. Kleb had a “yat'”, a reflex of e:, ai, and ei–note esp. ‘ai’, whereas khlebat’ has a short e, which becomes o after palatalized consonants under stress. Historically these vowels are quite distinct, which may explain why Vasmer ignored the comparison. They “merge” in standard Russian quite late, perhaps as late as the end of the 19th Century.